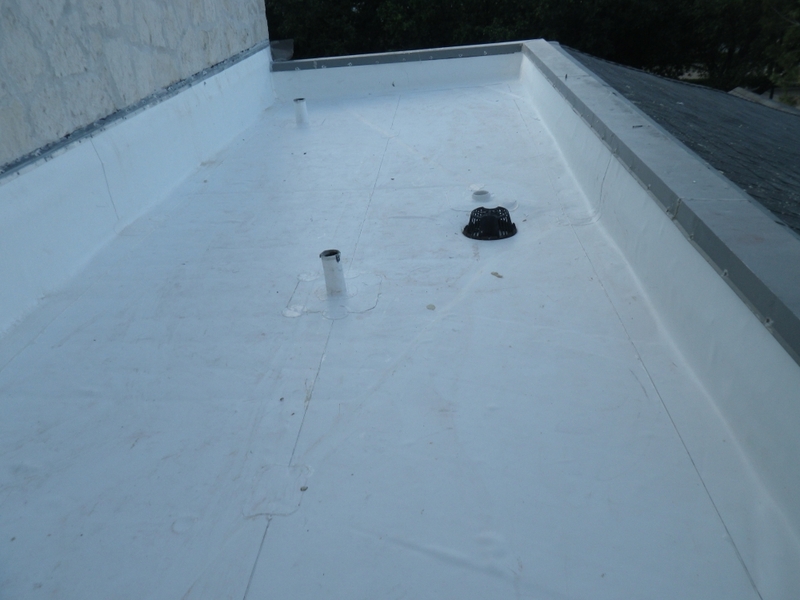 Tear-off multiple small single ply roofs and replace GAF 60 mil TPO. Tear-off steep standing seam roof and replace with Berridge CEE Lock panels. 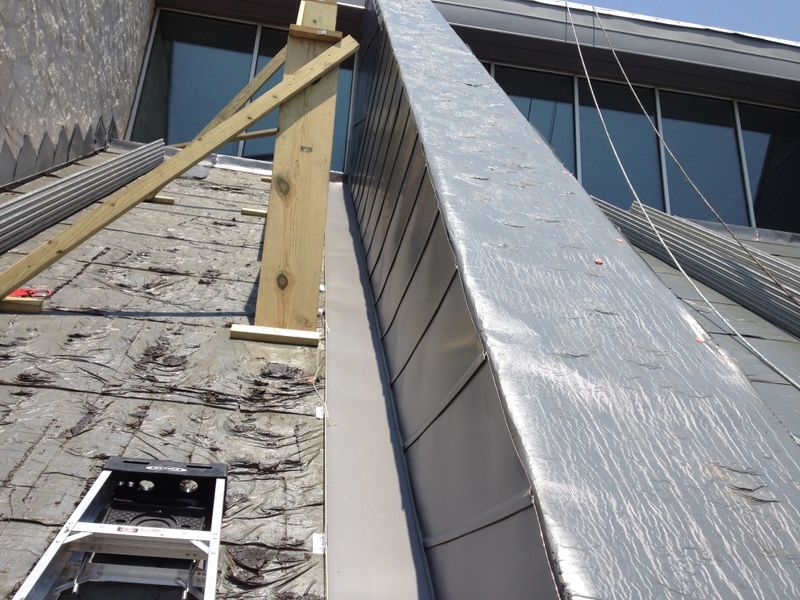 Tear-off wall panels beside standing seam and on steeple and replace custom fabricated panels. 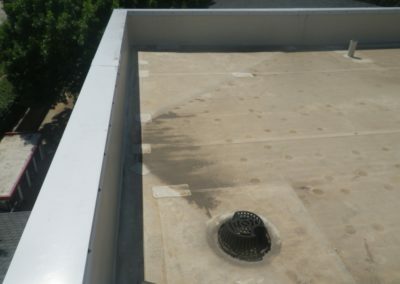 The project involved removing and replacing 9 TPO roofs. 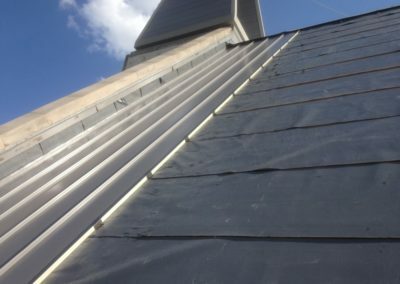 The only access was across a GAF Slateline shingle roof, over a 5 foot wall and then the roofs stepped up one above the other and a few feet back until reaching the largest roof above the sanctuary. The 1,500 square foot sanctuary roof was first since all other work was below it. 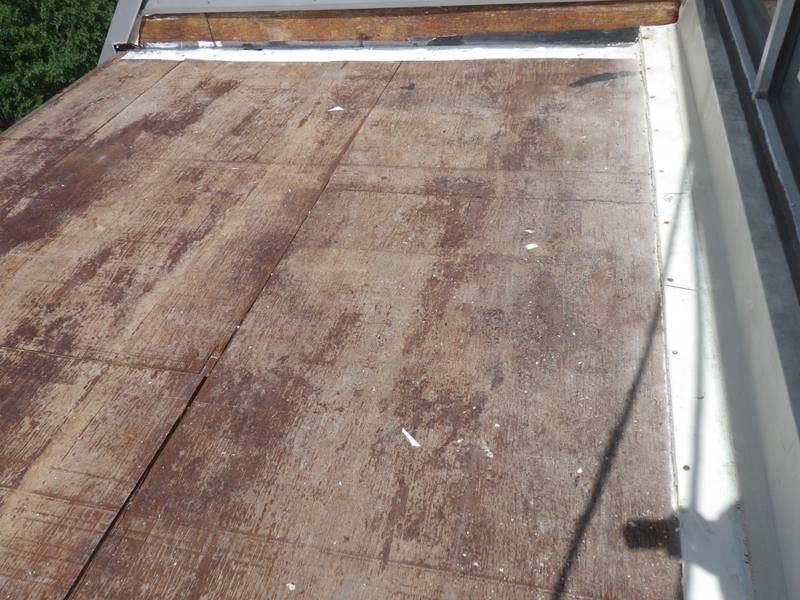 Then each roof was removed and installed from the top down. 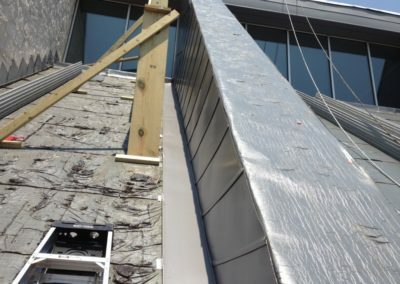 All material had to be handed over each roof and back down each roof. 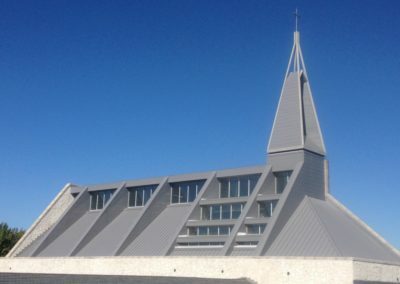 The roofs had metal edges on one side, wall panels on two sides and clerestory windows on the final side. 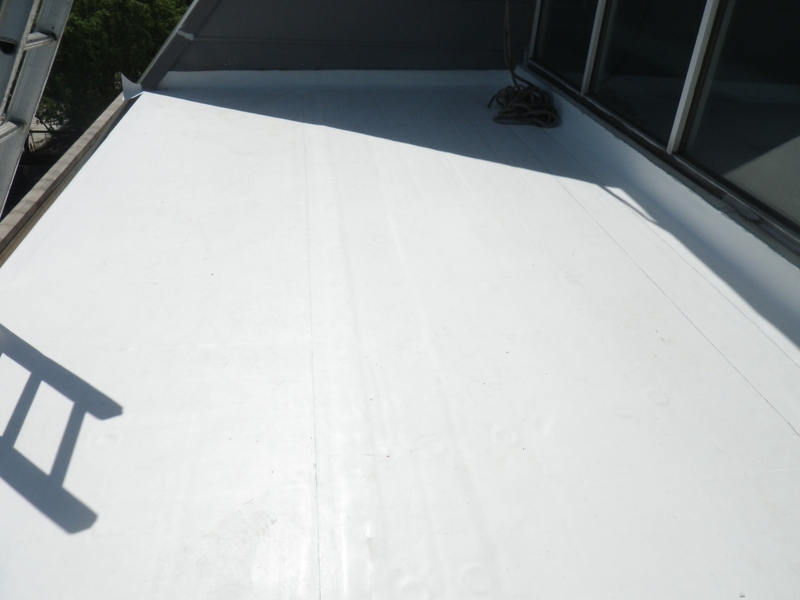 The standing seam roofs involved 8 roof areas. As with the TPO roofs, all material had to be carried across the shingles and over the 5 foot wall. The largest area was a 15:12 slope and 39 ft panels. 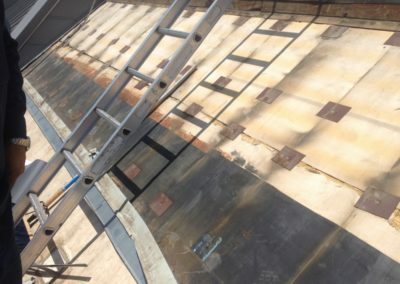 The panels were removed and installed by using a rope and harness system. The remaining 7 areas were 10:12 slope and up to 36 ft panels. 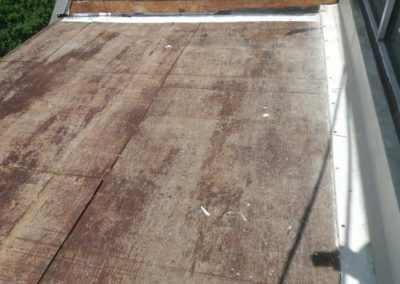 Three of the roof areas were 20 ft wide with wall panels on both sides and the others varied in width. The panels and wall panels had to be removed. 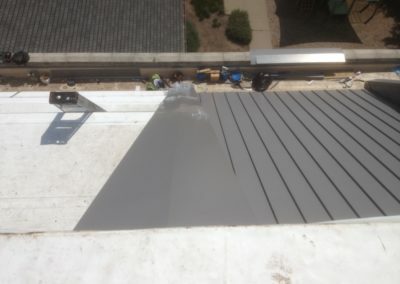 Then the first standing seam panel was installed. 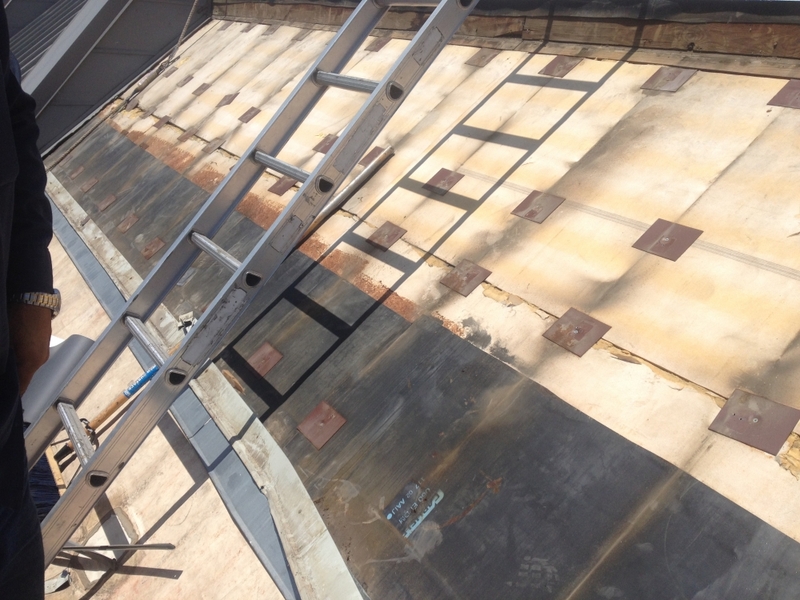 The wall panels were installed before the remaining panels so we would not be working on new panels. This process continued across the 7 roofs. 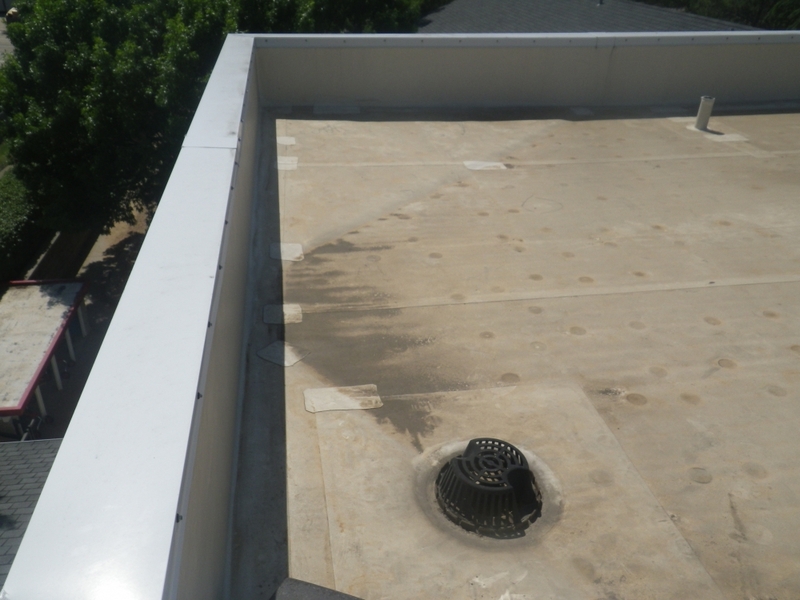 At the bottom of the panels, there was a TPO trough where the panels ended and the parapet wall began. 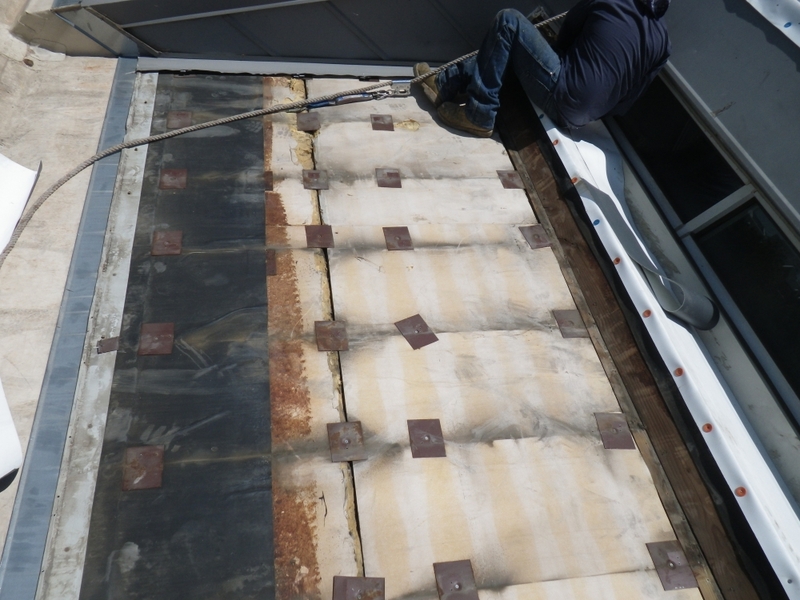 We installed the panels first so as not to damage the new TPO. 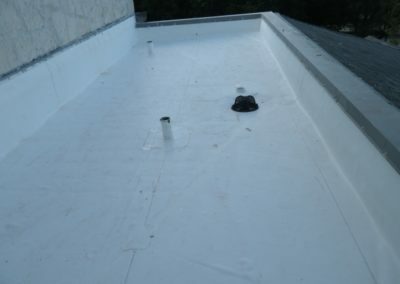 After the panels were complete, the TPO trough was removed and new material and insulation was installed. At the point where the TPO and the metal met, a counterflash system was installed. This allows the TPO roof to be removed and replaced in the future without having to remove the standing seam panels. The last area installed was the wall panels at the steeple. 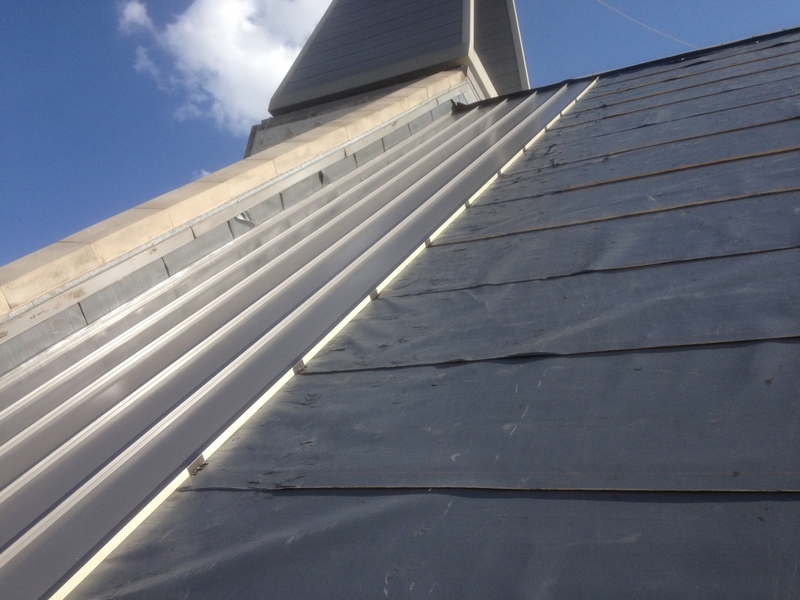 Access to the steeple was limited by open ends and the panel’s sides being above lower roof areas. Initially scaffolding was discussed above the roofs and all around the steeple. Due to a very expensive pipe organ below the steeple, the risk of damaging the roof and causing a leak above the pipe organ was too great. A harness system with bosin chairs was determined to be the best option. This allowed the installers the best access to all parts of the steeple. 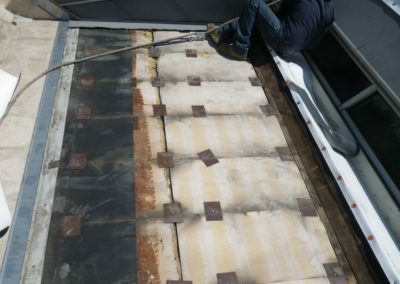 The panels were removed from the top down and installed from the bottom up. 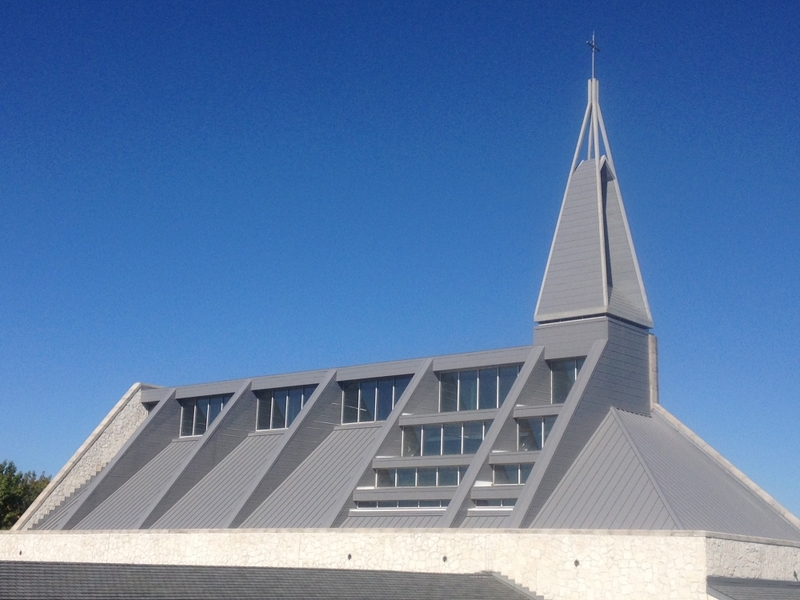 Upon completion, the new metal roof looks great up close, but looks even better from across the highway. The drab faded panels are gone and the new shiny panels are eye-catching.